Welcome to the HID Hitachi Press Office. All the latest press information is available for immediate download. Also available is the Archives section where older press releases and case studies can be accessed. Press enquiries can be directed to our contact page. One of the first industrial companies to gain the right to use the Energy Savings Trust's energy saving logo was HID for its range of Hitachi AC inverters. The company has long advocated the use of AC motor control to make energy savings in continuous duty cycles such as found in fan and pump applications. Indeed, Hitachi has invested heavily in pioneering the development of auto tuning and auto energy saving drives for high consumption duty cycles. While the internet is nowhere near as widely used in the UK as in the USA, there is evidence that the medium is beginning to make inroads as a vehicle for imparting technical information. 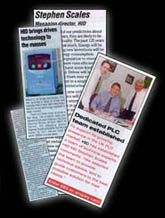 Such is the observation of HID's UK National Sales Manager Stuart Harvey.